There is a long tradition of volunteer support for ornithological surveys and monitoring in the UK, and the BTO has been the medium for channelling much of these efforts towards well-structured programmes of increasing value. These programmes provide an unrivalled comprehensive overview of the long- term trends for a major component of the UK's wildlife. This overview covers changes in population size as well as changes in reproductive success and survival that might have caused the population changes. The diagram to the left shows how the BTO's demographic schemes (highlighted in bold) contribute, along with other schemes, to measuring the processes that affect how populations change, especially the demographic variables of survival, productivity and dispersal. These are brought together in population models, along with data on land-use and environment to understand how these factors cause bird populations to change. These results are feed into the annually updated BirdTrends report and are used to provide advice to a wide range of organisations. When a declining population is detected, the BTO can inform conservationists of which stage of the life-cycle appears to have been detrimentally affected. Conservationists are thereby able to target their action or further research effectively. 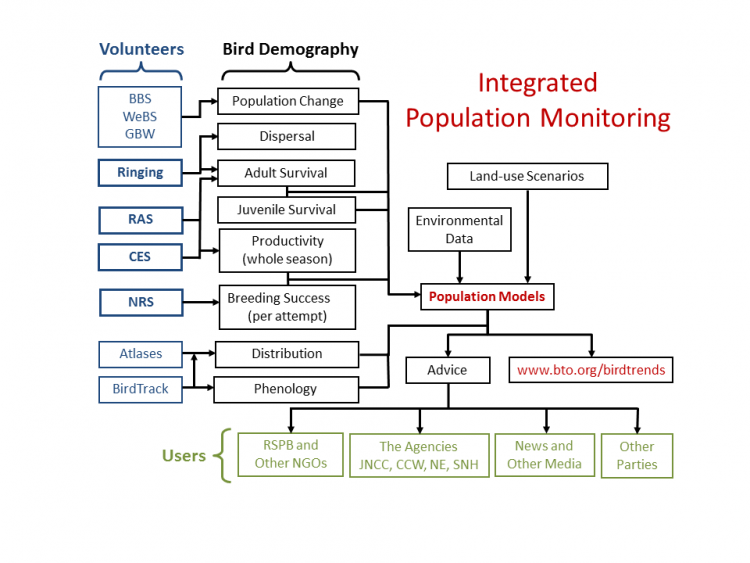 This is the main function of the BTO's Integrated Population Monitoring programme for UK birds. 1. To establish thresholds that will be used to notify conservation bodies of requirements for further research or conservation action. 2. To identify the stage of the life cycle at which changes are taking place. 3. To provide data that will assist in identifying the causes of change. 4. To distinguish changes in populations induced by human activities from those that arenatural population fluctuations. As the diagram above shows, changes in numbers of breeding birds are measured by the BTO/JNCC/RSPB Breeding Bird Survey (BBS) and Common Birds Census, Waterways Bird Survey and Constant Effort Sites (CES) ringing scheme. The Nest Record Scheme and Constant Effort Sites Scheme provide data on productivity, while the Re-trapping Adults for Survival and Constant Effort Sites schemes along with more general Ringing provide data on survival rates. Results from the Nest Record Scheme have revealed species suffering declines in productivity that parallel declines in population size (e.g. Linnet). More detailed analyses can relatively quickly show, for example, that every aspect of Corn Bunting and Skylark productivity per nesting attempt has increased markedly during their population declines. 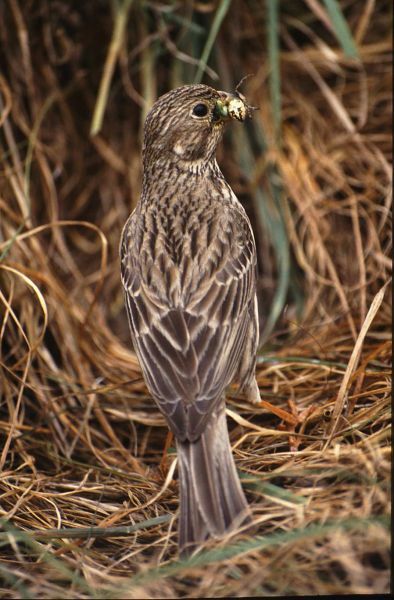 In this way the Nest Record Scheme has been able to direct conservation research towards investigating survival rates outside the breeding season for species such as Corn Bunting, but towards the nesting season for Linnet. Similarly, detailed analysis of the decline of the Song Thrush population has shown that declines in first-year survival rates were sufficiently large to account for the observed changes in population size; other aspects of survival and productivity have not varied sufficiently to have had a major impact. Analyses of declining Sedge Warbler populations using data from a variety of BTO monitoring schemes showed that changes in over-wintering survival, associated with below average rainfall in the Sahel wintering quarters, was the most important factor determining population change. Analyses of the population dynamics of seven Palaearctic-African migrant passerines have shown that over- wintering survival was the most important factor in all cases.